Bethlehem, PA (October 16, 2018) --Three-time Olympian and undefeated Anvar Yunusov takes on Joshua Davis in the eight-round super featherweight main event on Friday night, November 16th at The Sands Bethlehem Event Center. The show is promoted by King's Promotions. Yunusov, who competed in the 2008, 2012 and 2016 Olympics for his native Tajikistan, is now 5-0 with two knockouts as a professional. The 31 year-old fights out of Philadelphia, and turned professional in 2017. 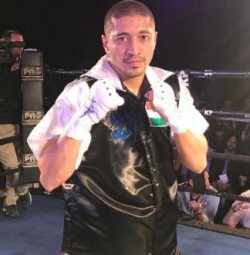 He has registered his two knockouts in his last two outings with a 4th round stoppage over former contender Mike Oliver, and in his lat bout when he destroyed Angel Monreal in one-round on September 14th in Philadelphia. Davis of Washington, DC has a record of 11-3 with five knockouts. The 27 year-old Davis is a seven-year professional, who has an impressive 7th round stoppage win over Carlos Rosario (7-1). Davis is looking to get back into the wins column as he has dropped his last two outings. In his last bout, Davis was stopped by undefeated Steven Ortiz on January 26th in Philadelphia. A full undercard of top prospects in action-packed matchups will entertain the fans in attendance in Bethlehem. Martino Jules (5-0) of Bethlehem fights Daron Williams (7-0, 4 KOs) of Washington, DC in a featherweight bout. Joshafat Ortiz (5-0, 3 KOs) of Reading, PA fights Joey Arroyo (3-5-1) of Bronx, NY in a lightweight bout. Michael Coffie (4-0, 3 KOs) fights Juan Goode (8-8, 6 KOs) of Taylor, MI in a heavyweight bout. Joseph George (7-0, 6 KOs) fights Andre Espuet (4-7, 3 KOs) of Cedar Rapids, IA in a super middleweight fight. Christian Montano (7-0, 6 KOs) boxes Paul Holley (6-1-1, 5 KOs) of Sarasota, FL in a light heavyweight bout. Jonathan Torres of Bethlehem, PA will fight Steven Lopez (0-2) of Philadelphia in a bantamweight affair. Alejandro Jimenez (3-0, 1 KO) of New Hope, PA takes on debuting Francisco Santiago of Reading, PA in a bantamweight bout. Yeuri Andujar (1-0, 1 KO) of San Cristobal, Dominican Republic fights Bryann Perez (2-11-1, 1 KO) of Carolina, Puerto Rico in a featherweight affair. In a battle of undefeated light heavyweight, Kendall Cannida (2-0) of Philadelphia fights Travis Toledo (2-0, 2 KOs) of Baltimore. Ricky Nuno (2-1, 1 KO) of Bethlehem, PA boxes Jonathan Burrs (0-1) of Hagerstown, MD in a welterweight bout. Tickets for the live event, which is promoted by King's Promotions, are priced at $50, $75 and $100, not including applicable service charges and taxes and are on sale now. Tickets are available at www.ticketmaster.com. To charge by phone call Ticketmaster at (800) 745-3000.